LOS ANGELES, CA - MAY 31: Job seekers pick up job applications at Fresco Community Market during Los Angeles Mission's 11th annual Skid Row Career Fair on May 31, 2012 in Los Angeles, California. 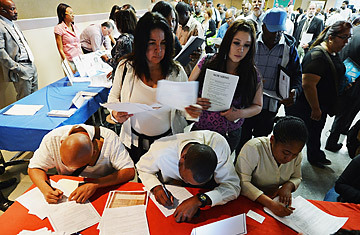 According to a Labor Department report, the number of people seeking unemployment benefits rose last week to a five-week high. The same federal government agency said that weekly applications for unemployment aid rose 10,000 to a seasonally adjusted 377,000. The most troubling aspect of June's job numbers--only 80,000 jobs were created last month--is that they are part of a new normal. Over the past two decades, U.S. economic recoveries have tended to be slow and jobless. In every recession from 1945 to 1990, jobs came back to prerecession levels six months after the economy returned to its prerecession level. But after the recession of the early 1990s, jobs came back 15 months later--though then employment grew vigorously. After the slowdown of the early 2000s, jobs took 39 months to come back. And this time, it may take about 60 months--five years!--for employment to return to prerecession levels, according to an analysis by McKinsey. What happened? Over the past quarter-century, two large forces have swept the world: globalization and the information revolution. They have produced economic growth and innovation that has lifted tens of millions of people out of poverty in countries like China and India. They have helped make American businesses bigger, more global and more productive. They have given us consumer goods and services that were unimaginable at cheap prices. But these forces make it much easier to produce economic growth by using machines or workers in lower-wage countries. Hiring high-wage workers--that is, workers in Western countries--becomes a last resort. While one can't disagree with the data, there is furious disagreement over everything else. On one side are those--mostly liberals--who say the economy is suffering from insufficient demand. That is, people and businesses are not buying things, and the only cure is for the government to step in, spend money and create demand. In general, I accept the notion that a country needs to have a structure of taxes and incentives that reward growth. But what, specifically, would help? U.S. tax rates are relatively low, compared with what they were in the past or with those of other rich countries. Regulations haven't changed much in the past few years, so that can't explain the current slowdown. The crucial question is, rhetoric aside, What specific changes on the supply side would make a difference? One of America's best businessmen has an answer. Fred Smith, the founder of Federal Express, argues that the key to job growth is stimulating private spending on capital goods and services. "There is only one statistic that is almost 100% correlated with job creation," he says, "and it is private investment in equipment and software." But what makes companies spend on equipment and software? More orders from customers or a better climate for business? The two are related. Sometimes businesses will simply create products, which then creates demand. Nobody asked for the iPad; Apple just created it. But most of the time, businesses hire workers once they see that customers are ordering their products again.